In an earlier article,  the author described a locally assembled, TV compatible, Windows XP desktop computer-based image viewer system, connected to Apple iPod Classic and flash drive for storage, display, and transmission of medical images. In a subsequent update of this article,  the newly emerging technologies, such as ultrabook, iPad-like tablet personal computers (PCs), and smart phones (including iPod Touch) along with the use of commercially available US Food and Drug Administration (FDA)-cleared novel medical imaging software (MIM software) were discussed. These articles also dwelt on the various aspects of testing and quality assurance (QA) of the display systems, wireless transmission of images, the salient features of the MIM software, and the advantages of using these devices among medical professionals. Readers are urged to peruse these articles since this letter forms a logical continuation of them. In the second article above, the author predicted the advent of tablet PCs based on Windows 8 in the near future. Among these new systems, the versatile, comprehensive, less expensive, and easily portable one from the point of view of the medical professionals appears to be the ultrabook. Ultrabooks are ideally defined by Intel as slim, lightweight (less than 1.5 kg) 'notebook' PCs, using their latest processor, that have long battery life. The author made a search of the various types of ultrabooks, based on the latest Windows 8, marketed by several manufacturers, which are suited for medical imaging use in developing countries. Since the storage of images from various equipments (ultrasound (US), X-ray, computed tomography (CT), magnetic resonance imaging (MRI), single-photon emission CT (SPECT), positron emission tomography (PET), nuclear medicine) in medical institutions in these countries is still finally in the CD-ROM form (the cloud storage concept has yet to emerge here), a relatively less expensive ultrabook with the optical drive feature will be of great advantage. In this article, further work pursued by the author using a low-cost (730$) Acer ultrabook with optical drive feature (Aspire M5-481PT) employing the MIM software is described. In addition, for those needing a bigger display than the pocket-type iPod Touch, but still very light to carry, the use of an optional iPad Mini (330$) is also suggested. The various features and utilities of these new systems/devices with MIM software for image processing, cloud storage, remote display, and transfer/transmission to other similar devices were examined with a variety of test patient and phantom images for education/training and for their diagnostic use. The author intends to share his experiences he had with these devices and hopes this will be beneficial particularly to physicists and medical professionals in this region. Ultrabook and iPad Mini: The 14 inch panel multitouch screen graphics display of ultrabook handles animation well with excellent resolution (1366 Χ 768 pixels) without unduly draining the battery. Available memory (up to 6 GB RAM) and external connections, along with the high processor speed (up to 2.6 GHz with turbo boost), allow for handling massive amounts of data inherent in medical images. The cloud feature with Wi-Fi facilitates storage and sharing of images with other Acer books, iOS and Android devices. The iPad Mini (software update iOS 6.1.5) has all the features of iPod Touch described in the earlier article,  except that it has a 7.9 inch display (1024 Χ 768 pixels), a much longer battery life and SIRI (a software-based personal assistant which enables simple voice-based commands). Other useful features of these devices are available in Acer and Apple websites, respectively. Java ver 7, Update 21. The third step is to procure an unlimited broadband of high speed (at least 2 Mb/s) for downloading and uploading images into their MIM cloud for storage. Cellular networks such as 3G and 4G may be the best from the point of view of speed, but they are not compatible with the ultrabook used; besides, although available as an extra option, they are very expensive. The author therefore employed the same Belkin Wi-Fi router (earlier used by him for iPod Touch) for the ultrabook/iPad Mini. Since unlimited use of high speed broadband was very expensive, the author got connected limited broadband of moderate speed (Freedom 497, 2 Mbps, 5 GB free storage) at less expense for his work, available from a local government company (Mahanagar Telephone Nigam Limited (MTNL), Mumbai). But the speed actually obtained at the author's end was only one-half of the quoted speed presumably due to cable loss. Nevertheless, it was found sufficient for this study involving only limited images. For those needing fast handling of a very large number of images, broadbands or cellular bands of still greater speed are available at increased cost. The fourth step consists of uploading into the cloud and then downloading and displaying Digital Imaging and Communications in Medicine (DICOM) images either on ultrabook or on iPad Mini or on both. The MIM software is intended only for (their) cloud storage and display of DICOM images and not for images in other formats such as JPEG, etc., In India, the CD-ROMs of images, given to the patient for his reference and records, are loaded with either JPEG (or similar) or DICOM data. In the latter case, some form of converted data is built-in for display of images in any computer (the author earlier downloaded and installed Apple iTunes software for transferring JPEG images from ultrabook to iPod Touch for viewing). The limited free cloud storages (5 GB) provided by Acer and Apple for the ultrabook and iPad Mini users, respectively are suitable only for JPEG or similar images. The author therefore downloaded a free commercially available DICOM to JPEG converter for storage of DICOM images in Acer and Apple clouds. The author displayed on the ultrabook and iPad Mini a variety of DICOM educational test images from several modalities, drawn from the websites providing patient, experimental phantom and resolution images (e.g., American Association of Physicists in Medicine (AAPM), Society of Motion Picture and Television Engineers (SMPTE) test patterns) or from CD's with patient images. A total of 45 test images were selected/uploaded and displayed on iPad Mini (including 15 sample patient images given free by Apple/MIM to iPad Mini clients) of which 30 images transferred to the MIM cloud were displayed on the ultrabook. The website images were first downloaded into the ultrabook computer for transfer to the MIMcloud using the Upload Utility tool, for long term storage. The CD images can be directly imported to MIMcloud using the MIM viewer. The actual procedure of upload of images into MIMcloud can be gathered from the MIM website. Once uploaded into their cloud, the images can be downloaded and reviewed on the ultrabook or on iPad Mini any number of times for a maximum period of 90 days (after which it can be extended, if required). For downloading from MIM cloud and subsequent analysis of images on the iPad Mini, the necessary software (called Mobile MIM) can be downloaded from Apple stores. For non-diagnostic viewing of medical images by patients, a separate Vue-ME software can also be downloaded for iPad Mini display by MIMcloud account holders. It may be added here that the MIMviewer display on ultrabook and the display on iPadMini have similar image processing/manipulation features, discussed in the sequel. 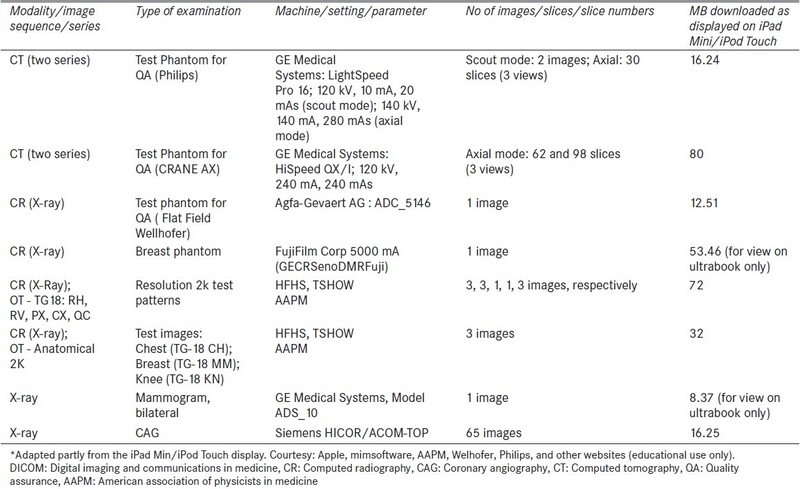 The technical details of some typical test patient and phantom images, uploaded into the MIMcloud, are shown in [Table 1]. All the sample anatomical images e.g., fused and MIP movie images of tumor, clogged blood vessels before heart bypass surgery, lumbar spine images in an advanced arthritis case, etc., could be readily tested visually for diagnosis. Many other routine images (e.g., implants, tubes, cysts, fluid collection, etc.) can also be interpreted for diagnosis. For medical image viewing, the most critical component is the high resolution support of the system/device and for detecting very small lesions, microcalcifications, etc., image resolution should be at its highest. As already stated above, the ultrabook and iPad Mini are able to resolve all the AAPM 2k Χ 2k and SMPTE test patterns and the test objects/patterns in other phantoms. It may be stated that the ultrabook with its present resolution will certainly fulfill its role in education and training and has good potential for diagnosis where such highest resolution is not required. Ultrabooks and iPad Mini with still better resolution are available for those needing them, but at increased expense (the latest Apple iPads with retina display may be anticipated to be better in this regard). Through the Acer and Apple clouds, the images (and other associate files) can be remotely accessed through wireless in similar ultrabooks or iOS/Android devices by medical professionals. Similarly, the images stored in MIM cloud can be displayed remotely through wireless on other Apple devices. It is expected that other useful features such as animation (cycling of slices in CT/MRI images or frames in coronary angoigraphy (CAG) at selectable speeds and choice of any desired one), rotation and flipping of images, and comparison of two different images on the same display (ultrabook with its large display is more suited for this) etc., will be incorporated in the software update of MIM Software. Considering these and other advantages already mentioned, it may be stated that the ultrabook serves the purposes of medical imaging in Indian hospitals. The iPad Mini's light weight and its moderate size display enables easy accessibility and analysis of images at any site. In association with the MIM software, the ultrabook will serve as a mini-workstation (although, as per FDA, this is not intended to replace full workstations) for analysis and processing and for providing wireless and portable access to medical images. Since this serves as a laptop computer, the full capabilities of this software are realized along with the several new features of the latest Windows 8 (since updated by author to Windows 8.1) such as Microsoft Office, CD-ROM drive, McAfee internet security, Skydrive, Skype, Kindle, Encyclopedia, Dictionary, Reading list, etc. The author is highly grateful to several companies and associations/institutions/groups (Apple, MIM Software, Osirix, AAPM, and others mentioned in [Table 1]) for access of the images from their websites exclusively for educational purposes. It is a pleasure to acknowledge the assistance of Mr. Kanak Chatterjee of MIM Software, Inc., in the effective utilization and application of their software and for many useful discussions. 2. Sankaran A. Pocket-size solid-state iPOD and flash drives for gigabyte storage, display and transfer of digital medical images: Technology update. J Med Phys 2012;37:159-62. 3. Yeager D. Images on the move. Radiol Today 2011;12(No.7) :12. 4. Available from: www.mimsoftware.com/about/mobilemim3pr. [Last accessed on 2013 Dec 1]. 5. Department of Health and Human Services. FDA 510k Mobile MIM 3.0 (K112930).PDF. dated 2011 Dec 5. p. 1. 6. MIM Software Inc., 25200 Chagrin Blvd. Suite 200, Cleveland. Available from: www.mimsoftware.com and www.mimcloud.com [Last accessed on 2013 Dec 1]. 7. Sankaran A. Private communication (sent 2013 Nov 23; reply received Nov 24).